I went to Kafana only once but I think it’s worth telling. It was my introduction to Balkan food. 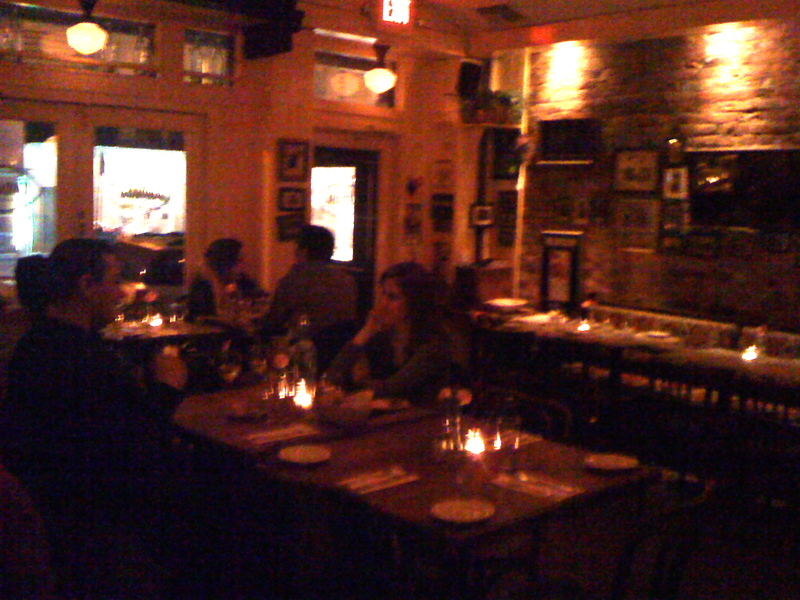 Kafana is a small, brick-walled restaurant in the East Village on Avenue C, barely a block away from where we lived when we first moved to New York (it didn’t exist then). I went with a group of friends with whom I go out regularly, about once every 2 months. We are a fairly international bunch and each time one of us chooses a restaurant from her home country. Sabina is Bosnian but the good Bosnian restaurant in the city apparently closes too early, so she took us to Kafana. Kafana serves Serbian food, which, as I understand it, is similar to Bosnian food, with pork. The dishes were served family style. The first plates arrived laden with spinach-and-feta–filled phyllo pies, but the star on the table was the Lepinja sa Kajmakom, an incredibly fluffy yeasted flatbread served, as advertised, “warm with creamy spread.” Then came platters of cured meats and cheese: smoked pork, beef sausage, but also cured lamb, and cow-milk feta that was pleasantly silky and mild. More meats for the main course – peasant sausage; smoked pork loin; chicken kebabs; prunes stuffed with chicken livers or walnuts and cheese, all wrapped in bacon – were nicely complemented by simple salads. The classic Sopsa (tomato, cucumber, onion, and feta cheese) and Kupus – thinly sliced red cabbage dressed with oil and vinegar. And, at some point, we ate Prebranac, Serbian baked beans. I can’t remember exactly when they arrived but I know I could think of little else for the rest of the evening, and they’ve been on my mind ever since. Coincidentally, I remember reading about Prebranac on Cooking Books a short while ago, and Sabina sent me her recipe – the lima beans are first cooked with onions and sweet paprika before being baked in the oven. So I now happily have two recipes on hand and no excuse not to make them. The desserts were sour cherry pie, crepes with jam or chocolate, chocolate and walnut cake, and Zito, a barely sweetened mix of cooked wheat, sugar, and nuts. Slightly unusual at first and quickly quite addictive. I will go back. To try more dishes, and, yes, eat Prebranac. This entry was posted on 21 March 2011 at 21:01 and is filed under Restaurants. You can follow any responses to this entry through the RSS 2.0 feed. You can skip to the end and leave a response. Pinging is currently not allowed.